This trip in the Andes is one of the most active tours we have, since you are going to be mountain biking every day. Your destinations and landscapes will include mountains, volcanoes, valleys, local towns, Indian villages and Andean markets. We want to offer you exciting but safe adventures during the day and delightfully comfortable haciendas at night. This is our program - enjoy it! We begin our trip with one of the Highlights of Ecuador, Otavalo; which is the most popular market in South America. Here you can do your shopping or just walk around taking pictures of the fascinating plaza de ponchos. After lunch we take our bikes and we go for a short ride to a rose plantation. Day one is to get us all acclimatized for the rest of the trip. Overnight at La Mirage. Today, the paramo is waiting for us. 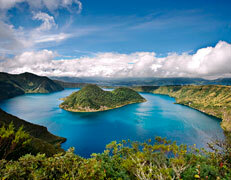 We are going to Cotacachi volcano and its sacred God's lake at Cuicocha (3.100 m). Here we will enjoy the landscape of one of the most important eco-systems of our country. Its exceptional flora has adapted to this altitude and there is, perhaps, the opportunity to see condors. After we arrive to our destination, where our bikes will be ready for us, we head downhill towards the Indian village of Peguche. We will discover our indigenous Indians making Andean instruments before they perform their music for us. Then we go to see the operation of Spanish looms at the house of Jose Cotacachi before riding on to Agato to see Miguel Andrango working at his back-strap loom. Finally we head for the Hacienda Cusin which was built in 1.602. Today we go riding our bikes through the Zuleta valley. Here we are going to see one of the most important haciendas run by a family which has been involved with the history of the country. We will see their agricultural production, condors and the beautiful landscape that they own. From here we descend downhill to Ibarra through cobblestone roads, enjoying the spectacular view of the valley and its people. Our driver will meet us at Ibarra to take us back to Hacienda Cusin. The day begins with a wonderful early morning drive southwards through the avenue of the volcanoes towards Cotopaxi province. We drive up to to Tambopaxi (3.900m) where We get on our bikes and begin our mountain bike adventure. 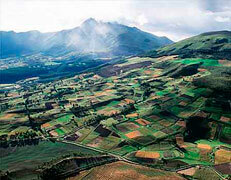 We will ride our bikes downhill by the foot of the Cotopaxi volcano on to a flat area near Limpiopungo lake. From the lake, we descend to the park museum, then continue until we get to San Agustin del Callo; a 400 year old hacienda where we stay overnight. 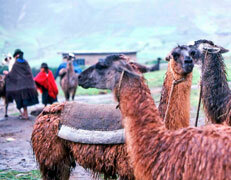 We leave our Hacienda in the morning and head towards Saquisili, the biggest Andean market in the country. We will pass by delightful fields and wonderful haciendas growing potatoes and vegetables as well as seven Andean peaks. We will firstly discover the attractive animal market where people trade all kind of domestic animals before moving on to the Seven Square market which is full of products from the highlands as well as locally made crafts. Make the most of this market. It is a very colorful place - hard to leave and hard to forget! In the afternoon we return to Quito. NOTE: Notice that for this tour we need a minimum of 4 people.